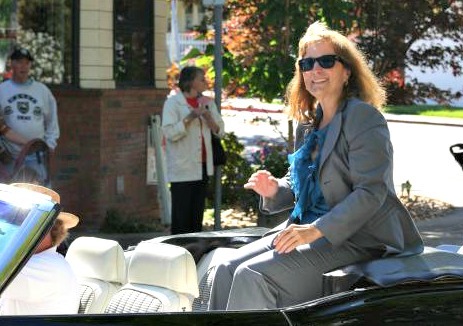 State Sen. Ellen Corbett in Pleasanton last June. SUNDAY COLUMN | It seems like Rep. Eric Swalwell is settling in quite well during the first few months of his first-term in the 15th Congressional District and that should be disturbing for his already declared opponent, State Senate Majority Leader Ellen Corbett. Swalwell is making himself visible in both the Tri Valley and Hayward, a constituency that is his weakness and Corbett’s perceived strength. Give Swalwell credit. His most appealing attribute is his youth and his innate ability to, at least, look and feel like the glamorized Hollywood version of what a young congressman is supposed to act like. To well-trained observers, the act is ridiculous and clumsy, but to the regular voters, people political types tend to forget about, he’s straight out of an episode of the West Wing. While Swalwell is hobnobbing and speaking to constituents without really saying anything or saying two things as once, it begs the question of exactly where is Corbett and is she going to allow Swalwell’s growing popularity to set and harden? One Democratic Party Central Committee member recently criticized Corbett’s lack of any presence in the all-important realm of social media. Corbett doesn’t have a Facebook page for supporters to congregate, nor does she dabble on Twitter. On the legislative side in the State Senate, Corbett doesn’t even seem to have a press person sending out releases trumpeting her legislative exploits. On all fronts, Swalwell is miles ahead of Corbett. These problems for Corbett will be further exacerbated in the coming election season leading to 2014 because the corporate media, another form of voter outreach, is not going to view her candidacy in favorable terms. In this scenario imagine Swalwell mocking Corbett for a news report last year including her on a list of state legislators who passed on the cost of repairs to taxpayers for state-issued cars just before purchasing the vehicles for their personal use. The corporate media, already happy to blame Sacramento for every ill will cast the story as the entrenched legislator again screwing over voter versus the still unblemished young congressman. I bring this up because Corbett has a somewhat rocky relationship with alternative media outlets and bloggers, weirdly, the East Bay Citizen, included. She may be out-of-luck with the network of Patch sites, too, which incidentally, do not have a site covering Hayward. However, they do in the Tri Valley along with a potential conflict of interest. One of the Tri Valley editors is married to one of Swalwell’s staffers. So, when the Patch immediately ran Swalwell’s comments on their site following President Obama’s State of the Union, along with access to Swalwell’s inauguration day, you now know how that happened. Even worse, this perception of Swalwell beginning to win the hearts and minds in places like Hayward may not be exclusive to voters, but also public officials. Assemblyman Bill Quirk and Hayward Councilmembers Mark Salinas and Francisco Zermeno have been seen often at Swalwell events. Zermeno, during last week’s council meeting, talked up Swalwell and Salinas, on several occasions, has posted pictures of himself and Swalwell while promoting the congressman’s events on his Facebook page. The Hayward Chamber of Commerce is already with Swalwell and Corbett’s top critic, Mayor Michael Sweeney, is very unlikely to be one of her supporters. So, what is Corbett to do? Sure, she can continue to raise money for her campaign because she will need a lot of it and most know fundraising is not her strong suit. She can sign-up for Facebook and Twitter and make herself more accessible not just as the area’s long-time representative in Sacramento, but also make it clear she is running for congress against that guy over there. But, most importantly, Corbett needs to realize she is the overwhelming underdog inthis race against Swalwell. This isn’t just a potential campaign gimmick, but well-suited to Corbett’s past performances. Old hands in Hayward and San Leandro often recall her surprising victory for mayor in San Leandro nearly 20 years ago–a race that forever upset decades of Jack Maltester’s old boy’s network in that city. Four years later, Corbett won a gallant came-from-behind primary race for the assembly over Johan Klehs and John Dutra that still amazes many in the local Democratic Party. But, if Corbett still thinks voters will simply favor her over Swalwell because of her resume or her candidacy represents the next logical step in her long career of service, then she’s got another thing coming. In fact, Swalwell’s victory over Pete Stark is a fine example that voters have already disagreed with that premise. -Hayward Mayor Michael Sweeney, Mar. 5, during a City Council meeting about a possible ordinance disallowing food-sharing for the poor in public places in the downtown area. Thomas Frazier was tabbed the man to clean up the Oakland Police Department this week. The former Baltimore police commissioner is no doubt a divisive figure. Hired by the city last year as a consultant, he lambasted the department for its shoddy handling of Occupy Oakland. That report shocked the mayor’s office and set off celebrations in the Occupy movement. But, those same hardened protesters also read much into Frazier’s long career in law enforcement and ties to vastly conservative think tanks. The Oakland City Council had a rare good day’s work on Tuesday passing a campaign financial disclosure ordinance making every candidate’s statements to be posted online and easily searchable. The council also passed a measure making it illegal for the city to invest in gun and ammunition manufacturers. They also approved a $11 million outlay for new police vehicles. Hayward may have made precedent in the East Bay this week after jettisoning its red-light traffic camera program. The council and police chief worried the cameras were actually increasing incidents of rear-end collisions. The fear to driver’s safety was so great that the council chose to lose over $100,000 by ending the contract earlier. Hayward Mayor Michael Sweeney also made uncommonly terse statements for non-profit free food-sharing groups who feed the poor in his city. The normally kind Sweeney told a group from very nearby Castro Valley to basically worry about the poor in their town. Good news from former Alameda County Supervisor Nadia Lockyer, her attorney told an East Bay newspaper she is doing well and out of rehab. On the pastoral island of Alameda, Police Chief Michael Noonan announced his retirement in June. An interim was named to replace until a new chief is found. Noonan, 51, reached the ripe old of age when most police and fire chiefs leave their post for “retirement.” Nonetheless, aside from allowing a mentally-disturb man drown himself in the bay, Noonan’s two years as chief was without incident. Although, this story comes by way of San Francisco, it may have serious consequences for those long struggling to save San Leandro Hospital from closure. San Francisco city leaders announced a deal build a new hospital at Cathedral Hill and vow to rebuild the community hospital at St. Luke’s, the latter being owned by Sutter Health, the owner of San Leandro Hospital. Most on this side of the bay maintain Sutter’s inaction over the year with San Leandro Hospital is connected to St. Luke’s and nothing would happened as far closure of the facility until the situation in San Francisco is resovled. It’s resolved and now the poor and underinsured in Oakland and Central Alameda County await Sutter’s move. –Scott Olsen (@OlsenVet) Iraq War veteran and the Occupy Oakland protester who suffered near-fatal head injuries when police fired a beanbag round at this head in 2011, tweeted Mar. 6, after chatting with Oakland Mayor Jean Quan and a public safety community meeting featuring police consultant Bob Wasserman. >>>Finally, for those of you who wrongly portray Oakland as a tad lower than hell on earth, wake up! “Why all my friends are moving to Oakland” is just another blow to San Francisco’s perceived preeminence in the Bay Area. Because as the writers says about “The City,” “The douchebags are winning.”. (TheBoldItalic.com, Mar. 4). Posted in Ellen Corbett, Eric Swalwell, Greg Ahern, Hayward, Jean Quan, Michael Sweeney, Oakland, Oakland City Council, Oakland police, S.L. Hospital, San Francisco, Scott Olsen, Thomas Frazier. Bookmark the permalink. Corbett will lose. All you have to do is read the last two sentences. Ellen thinks this is all owed to her just like Pete believed did. As long as Corbett has lost Sharon Cornu's business card, she should be alright. In regard to “Where is Ellen Corbett,” I think we should assemble a search team and find her, and as quickly as possible, and regardless of how much it costs to do so, since I can think of no greater tragedy than for us to permanently, or even temporarily, lose one of our politicians. They are all the same. Union labor whores. I remember the Klehs, Dutra, Corbett primary. Klehs and Dutra split the male vote. Corbett won. With Corbett and Hosterman in the primary against Swalwell this should not be a problem. Swalwell rolls Corbett in the general. Her base is narrower than his. Good for Eric! Voters are clearly looking for a new generation of leaders to step up. They are sick and tired of the status quo. I think Mike Honda is the next to go. He might be likeable, but he's an empty suit and not a very strong legislator. Look for Ro Khanna to continue the trend of taking out incumbents. Spier, Lofgren, Eshoo, etc. better start taking notice. They may have one more term in them, but come 2016 or so they better think strongly about retiring or they will become casualties as well. The top-two primary is the best thing that has happened in California since sliced bread! Khanna should run in the 15th instead. Khanna-Honda would be the strongest one-two punch for the east bay…rather than either a wounded Honda or a despised Khanna plus the undeserving airhead that is Swalwell. Corbett will win because Swalwell is too conservative for Alameda County and she won't make the same mistakes Stark made. Ellen couldn't win on her best day. She'll make even more mistakes than Fortney. Police chief of Alameda, retiring at age 51, about 6 years before the average patrolman retires. Amazing, on average a police officer retiring at age 51, can expect to live another 31.5 years. Longer than his career. During which he will get at or close to 90% of his $185,000 base pay, or about $165,000 a year for 31.5 years. Perhaps much more depending on what Alameda allows to be used for calculating their pensions. Some cities allow for pensions to be calculated on more than just base pay. Not to overlook the TCOE (total cost of employment compensation) he got in 2011 of $361,000. 2012 may have been even higher. To have a entire career's pension based on the pumped up pay you get for just 2 years on the Chiefs salary is yet another reason why the pension system is facing a mess in the future. Credit our legislators for allowing the huge increases that went to local city employees. Not just police and fire, but to all employees. Ellen beat both Klehs and Dutra for her Senate seat. Swalwell will lose the woman voters that voted for him because they didn't like Stark. Ellen will win with 60% of the vote or more. The District has a lot of progressive independents that will vote for her. In your dreams. Eric is around for as long as he wants to be since he gives a damn about constituents and knows how to treat people. Same shmo writing who said that Hayashi was 'so strong' that she was someone worth fearing. Been there and done that. She may win because she is bland, play it safe, not rock the boat type that some people love. What has she done in 12 years in Sacramento. This is the dream that East Bay Democrats have been living for the past 40 years. They think everyone is “progressive” because the Democratic candidates have always prevailed with margins likek 85-15 or 75-25, or at least 70-30. Missing from their thinking it that there was NO other choice on the ballot except some placeholder Republican thrown up on the ballot just to fill in the space. Their opposition was a bunch of nothings, so sure you got the votes, even of independents, but NOT because they did so by choice. They effectively had NO choice except a protest vote for a nothing candidate. Heck, Stark used to get some crazy chiropractor year after year. Those Republican candidates were complete jokes with ZERO dollar. The myth that there is a army of “progressive independents” is just that, a myth. We saw that clearly demonstrated in the last election. It wasn't just that Stark was too goofy, it was also a demonstration that a sizeable group of independent had been waiting years and years to vote for someone who wasn't falling all over himself to please the “progressive left” who had controlled the election process for decades. WE, the independents and unrepresented moderate Democrats have been sick and tired of the offerings of the Democratic party elite for years. With the “top two” in place, you aren't going to be having any cakewalks any more. Corbett is hardly a scintillating candidate. For too long she has been part of the knee-jerk Sacramento crowd. That is why she is now Majority Leader in the Senate. Don't forget that in 1999 as a Assembly member, Ellen Corbett voted to take the lid off of ALL the pensions in California, allowing the gigantic leap in public pensions that now plague the entire state, and local governments. She ALSO voted to allow all those pensions to be boosted retroactively. Thus tens of thousands of workers who had perfectly wonderfull pensions coming after 29 years of service, only worked another few months under Ellens new rules and had their entire career pensions jacke up 25% to 35%…overnight. For many, this was like getting a last minute Golden Parachute of from $200,000 to over $1,000,000 in extra pension. Like being given a entire house instead of a gold watch. Ellen, courting public employees has never publically said her vote to do such boosts, was wrong. Now, the entire state is paying a terrible price for her error in judgement. Even her own San Leandro has had to go back and cut way back on those overly generous pensions. Reducing them back to the old rates before Ellens foolish vote. EXCEPT, she grandfathered in all exhisting workers. Even those who started in 2010…They stay on the bloated unsustainble rate until they retire 25 years from now. Do we really need such wisdom back in Washington DC. If you bet against Ellen–You will lose. She will win the Dem. vote, the women's vote, and the independent vote. This moderately conservative family will vote for her. Your white male tea party can vote for Eric. Swalwell needs to check out how many times Ellen has been paid when she hasn't attended meetings and work sessions. Ellen seems to think it's ok to spend tax payers money while doing nothing. Swalwell is new and respectful, something that both Stark and Corbett lack. As a women voter I like Swalwell and wish him well. We will hear from Ellen when she comes knocking for money and endorsements. Sorry Ellen not this time! 12:50 PM — Just keep feeding us those talking points. I'm sure you are convincing the doubters. Love this one “the moderately conservative family will vote for her”….followed by “the white male tea party can vote for Eric”. Looks like a Cornu staff member is still in a state of disbelief. Yeah, 2012 was just an anomaly, sure it was. Just “rookie” luck, for sure. Wait until the “veterans” learn how to pitch to him, right? Nice to know the party insider mentality hasn't shifted despite the facts. This woman voted for Swalwell, but will vote for Ellen if she runs. When Swalwell endorsed Thorne he lost the woman vote. Please explain. Endorsed for what? Mayor? For those of us not up on that area, explain how Swalwell lost all women. Swalwell is another McNerney. He's GOOD for the district and is there until he screws up. Corbett is a non-issue; she's the day before yesterday's news. Needs to go back to her practice and actually practice, along with baking cookies. 7:41, OMG “hooked up”… Well, I guess he'll just have to marry them like Pete did 20 years ago. I'm guessing they won't be 36 years younger. Oh wait, that math won't work. BTW, 7:56 comment was meant to be laughing at the 7:41 comment. All of this, “Swalwell is in trouble” when the party pros “get tough” is laughable. Its been so many decades since they ever had to compete, they are flabby and out of shape, but still have a inflated self image of their capabilities. Swalwell will surprise them again. Should have people standing and applauding for that record. Ellen wins hands down. Not even close! Anything is possible…in your dreams! It's the last thing she wants brought up because it would involve charges brought up against her! Her staff never says anything publicly or in a formal complaint because it's considered a career killer – but it's true! Ellen makes her staffers take her car in for service too! Tax payers paid for this and then she buys the car. Milk it Ellen. Get every dime you can. For heaven's sake, will the journalists and supporters of opposing camps just pipe down. Discussions here sound like a bunch of 3 year olds, nanny nanny naa naa. These folks, Corbett and Swalwell have just been elected. Leave them alone to do their jobs. There will be a time when they will be required to come back to us and be accountable for their performance. THis sounds like President Obama, who I voted for. He was out campaigning for 2014 when he should been doing the job he was re elected to do; which is pull everybody together in DC to avoid the sequester. The discussions here looks just like that. Hands off Swalwell and Corbett and let then perform. 7:13, Agree, there seems to be a bunch of folks trying to stir up the party “regulars”, a year ahead of time. Seems like they are still licking their wounds from 2012 when they were displaying the same disconnected bravado. Swalwell has another 12 full months to show if he is doing his job. After that, they can start telling the voters why he doesn't deserve re-election. This early jabbing shows how shocked they still are that the voters didn't see matters their way. Seems to be that a rejected concept hasn't been fully accepted. That misguided concept was that in all the past 40 years, that voters really were fully behind the incummbents put forth by the party. The reality was that lots of Democrats and independents long felt that they were never given a true choice. We got the tightly controlled party choice and no other viable choice. Now, in every election, we are likely to get two real choices. About time we has some real Democracy so that some of us no longer have to go from being college seniors to Medicare seniors with ONLY ONE choice. Thank God for “top two”… Finally a choice. Go Ellen Corbett. My Family will vote for you. Where's Ellen? Probably soaking her eyes in whiskey. This lush won't win. She no longer has that big chunk of stupid in San Leandro to push her over the top. Bye bye fatass, you and your bottle should be very happy in some corner. You must be really be scared of her to resort to name calling. Grow up! The only time I would be scared of Ellen is if she appeared naked somewhere. This loser will be dumped next year and the world will be a better place when she is done. Hey folks, this is not an issue between angry white men and single Black gay women. It is about degeneration in our bloody politics. Americans have fought with other nations and invited their wrath on 9/11. Now they have nothing better to do but fight amongst themselves and tear each other apart like it is happening on this thread. Just bloody hell grow up all of you and shut the hell up. Give us voters a chance to watch how these folks perform. What a bloody nonsense we have come to. My family and I live in the District that swallwell now represents. We saw who supported him and how they acted. We are far more progressive on social issues than swallwell and his republican, tea party and conservative followers. We are moderate on fiscal issues and his followers want to destroy all the good that government is needed for. My family does not want to support someone who has taken money from the Karl Rove led republican and tea party special interests. That's why we will support Ellen Corbett-she is progressive on social issues and moderate on fiscal issues, as is this district. Anon 12:38 Is there some place I can go and see for myself if Karl Rove and the Republican party gave Swallwell money. If you cannot back up your claims with where this is posted as public information, then you are a bunch of crap and should be ashamed of yourself that you are polluting our political system. You could better spend your time watching the swirl of your toilet bowl instead. I'm not anon 12:38 but I read in the paper that he got large sums of money from a republican group controlled by Rove. You'll have to do your research. I also read he got large sums from developers. I won't vote for Swallwell. I think we need more women in Congress and will vote for Corbett. Ellen is through you fools. Unless she can unload thousands of low-income and illegal aliens from Oakland into Pleasanton, Dublin and Livermore, she HAS NO base of support. You're done Ellen. Good bye, good riddance and let's hope that barn door doesn't hit you on your fatass on the way out. Eric's base of support is racists, sexists, and extreme ranting conservatives like the above poster. That's why Ellen will win in 2014. She is fiscally moderate and socially progressive and so is the district. I don't think it will be even close. Most people I talk to in the Congressional District have indicated they will vote for her. She has never made the type of errors in a campaign that Stark did.